PURPOSE: To taste the edge of what is next and sense now & next in a whole new way, opening the way for Bronze Medal Mastery. Minute two: Reflect with deep interest on your most recent experience. Notice your energy and body sensations. Minute three: What does your body say about this activity? Hint: if you have more energy, it indicates a resonance, perhaps a near-win. Minute four: When will you practice this activity again? What does your body say now? Minute five: Are you willing to explore your ways of mastery, so that your practice of mastery opens up to the mastery of your life? Complete your practice with a heart smile – place hands over heart with appreciation for each moment as a new edge to master. Daily 5 minute Practice: Practice Bronze Medal Mastery with intention by reflecting on your life activities. Consider bringing Money Mastery to your experience. 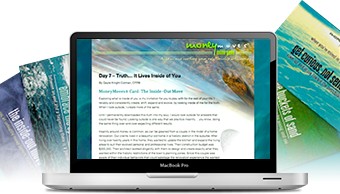 Are you willing to experience money over and over again as a near win? Be awake to the vitality of your life that is moving on the edge. Once we have built our work and our contributions around our natural gifts, we have joined a great gravitational river where the current is flowing in the direction we wish to travel.